Cover Story: From Mississippi to California. DJ T.E.C is making a name for himself throughout the USA with his new album titled "Legit". 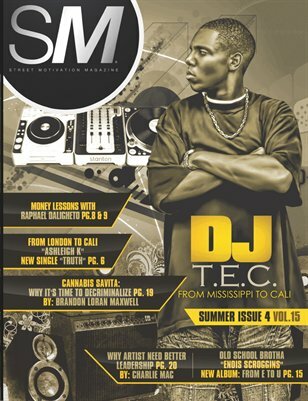 Street Motivation Magazine presents The recording artist, producer, DJ and entrepreneur "DJ T.E.C" and his new 2012 Album titled "LEGIT" sold at your local stores now. Inside Stories: London's Ashleigh K interview, Old School Brother "Enois Scroggins" new album, ) also check out "Why artist need better leadership" story by: Charlie Mac and a hot story on "Cannibus Sativa and why it's time to decriminalize by: Brandon Loran Maxwell" It's all right here! (support The West Coast only Indie Artist magazine) by purchasing your issues today!